What Can I Do With All These Darn Fall Leaves? I love a good maple tree in the fall. Especially the Sugar Maple, with it’s bright orange flaring colors. That’s why we chose to plant one 6 years ago after our wedding in October. It’s our wedding tree. We love it. But Oh. My. God. The amount of leaves that drop from it! Like, really? It’s still a sapling by maple tree standards, but between it, and our neighbor’s gigantic Oak tree in their front yard, sometimes we can barely see grass in that corner of our lawn. What’s a guy to do with all these leaves? Well, in our township, we do have a leaf collection. Once a week a street sweeper comes around, and anything you’ve raked onto the curb in front of your house gets sucked up, shredded, and blown into the back of a township dump truck. A lot of places have this system because it’s efficient, it keeps the neighborhoods looking nice, and the township uses it in their compost and landscaping. Places where this isn’t an option, you can usually see people raking them into big piles, and either loading them up into trash cans, or bagging them into those gigantic jack-o-lantern orange bags… just in time for Halloween. But there must be SOMETHING we can do with all these leaves, right? Well, actually, there’s at least 9 things! 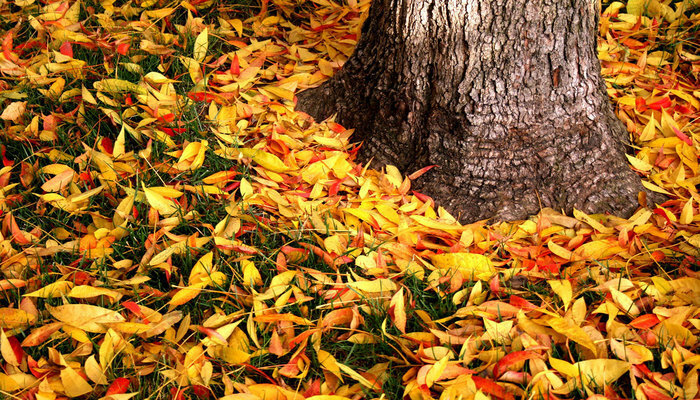 Shredded leaves make a great fall mulch alternative. They do the regular mulching things, such as keeping the sun from drying out the soil, they help retain moisture, and they prevent weeds from growing. Bonus: compared to grass mulches, leaves don’t bring additional weed seeds with them. 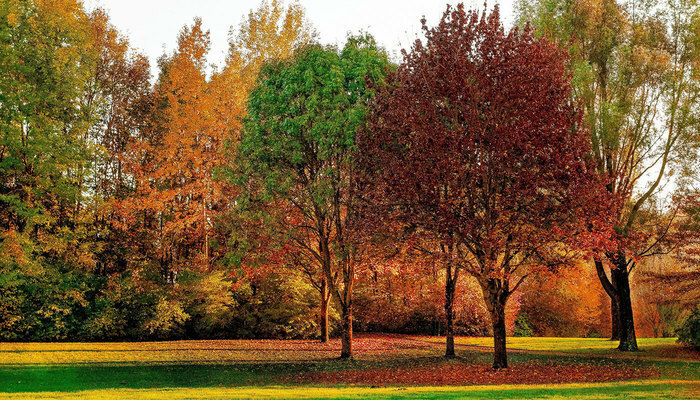 Browns typically include fall leaves, twigs, pine needles, paper products, non-coated cardboard, sawdust, etc. Greens typically include grass cuttings, vegetable/fruit scraps, coffee and tea grounds, animal manure, and plant trimmings. If you’re cutting grass and raking at the same time, you have the makings of a perfect compost pile. Leaf mold is not moldy leaves. Well, ok, I guess it kind of is, but it’s not gross like how you’re thinking. 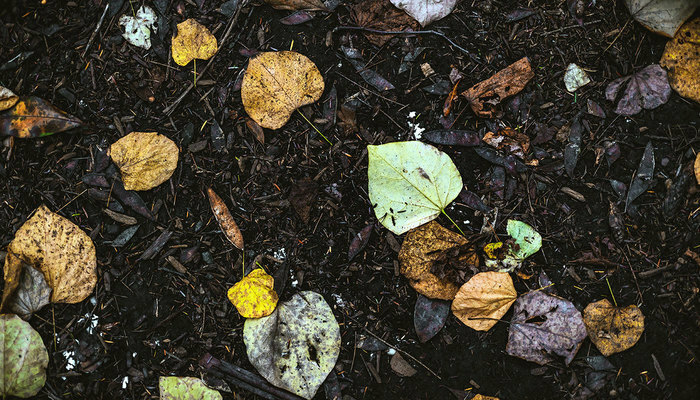 Leaf mold basically is what happens when leaves decompose and compost on top of other leaves that are decomposing and composting, on top of other leaves that are doing those things, and so on. You know when you walk through a wooded area, and you get that really unique woodsy smell? That’s mostly the leaf mold. If you scoop up a shovelful of soil in the woods, you’re going to find perfect, delicious looking leaf mold compost. Add this stuff to your garden, and you’re not exactly giving it a dose of Red Bull, BUT you are adding structure to the soil, which will prevent it from compacting down, and increase the ability for roots to spread out and grow properly. Ahh, the lazy-man technique. Just rake them into your garden area, grab a hoe or a garden rake, and start working them into the top layer of soil. When you’re satisfies, walk away. Boom. Done. This gives you the benefit of using the leaves as mulch, and making a slow leaf mold throughout the winter. They won’t be completely decomposed in the spring when you’re starting your garden, but that’s fine, let them do their thing. A good pile of leaves can actually make a really decent insulation barrier around tender perennials, such as fig trees or strawberry plants, and also root crops, such as carrots or beets. If you’re insulating something bigger, such as a fig tree, you might want to install some wire fencing around it, about a foot radius out from the trunk of the tree. Fill it up with leaves, pushing them down as you go, to create a nice warm winter blanket that will protect your tender little buddy. If you’re not sure leaves will cut it, wrap some burlap around the tree before adding the leaves. #doubleblanket. For strawberries or root crops, just go ahead and pile a bunch of leaves right on top of them. They really don’t need much additional attention. Easy peasy. Seriously, people have been doing this for hundreds of years. If you have a root cellar, or an unfinished basement that you store root vegetables in over the winter, try embedding them in piles of leaves. Many people use newspaper or sawdust, but I have always found leaves to be easier to handle, and easier to clean your veggies when you’re ready to use them. Obviously the easiest solution on the list (and my personal favorite) is to not even rake them. What I do, is run the lawn mower over heavily leafed areas a few times, to shred the leaves up a bit, and let them filter into the lawn. This adds organic matter and lots of healthy nutrients to your lawn throughout the winter, which will lead to a full, healthy looking lawn in the early spring. 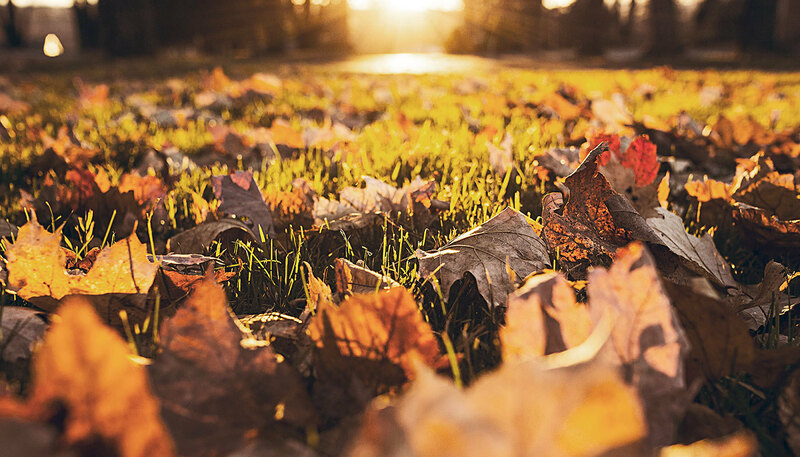 If you have a ridiculous amount of leaves, you should probably rake a few times throughout October and November, but consider leaving some leaves on the lawn for yourself to mow over. Preserving leaves is a really cool project to do with the kids. I’m not super crafty, so I’m not going to demonstrate the technique. Check out this website to learn some cool techniques. Once you’ve preserved your leaves, then it’s time to decorate with them! Make a leaf wreath, or grab a couple of sticks and hot glue them on for a “we just ripped a few branches off at the right time” kind of decor. OR, go the easy route, just drop a couple different colored ones onto the dining room table before the Thanksgiving dinner gets served. Instant fall table. 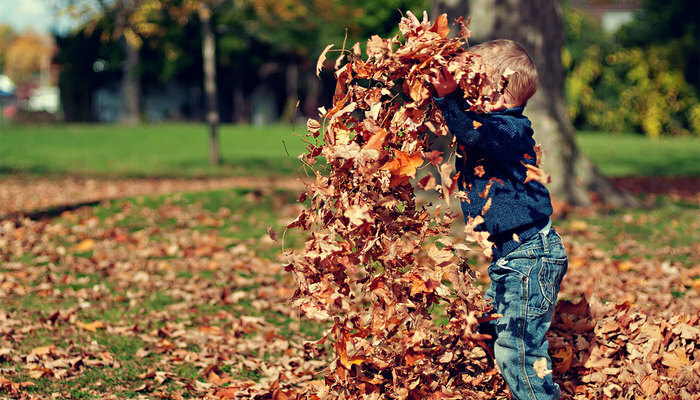 Perhaps every kid’s favorite fall activity is to jump into the nice neat leaf piles that their parents spent endless hours (ok, minutes) raking earlier that day. I’ve found the best solution here is to invite them to help with the raking. This works in 2 ways - 1, it makes them realize the effort that goes into raking those nice piles, and 2, it gets them nice and tired, which means they’re going to spend less time redistributing all your leaves. But seriously, go ahead and jump in with your kids. It’s more fun for them if they see you enjoying yourself as well, plus it’s not REALLY that much extra work to re-rake the pile. My favorite picture of my wife is of her in the middle of a leaf pile when we were dating. She’s throwing the leaves up in the air like a little kid, and the expression on her face is pure glee. But I won’t share that picture. Come on, I’m not going embarrass her right after we celebrate our anniversary.